There's a saying "Home is where the heart is," that you're likely familiar with. But have you heard the other ones? They include, "Home is where your TV is," and "Home is where your sense of safety exists." Alright, these probably aren't as traditional, but they're true, right? Well they are true as long as your house is well protected from unwanted visitors. 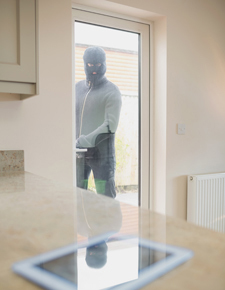 In order to keep your home safe you should consider a few home security practices that are more commonly found at commercial properties. If you would like to implement any of these ideas or have something else in mind be sure to speak with a professional locksmith who can take on the sale, installation and service of your new security features. It is so simple yet extremely important. Be sure you're taking proper measures to increase the security of the exterior doors around your home home by ensuring that every door is equipped with a high quality deadbolt. This type of lock is extremely difficult to pick and it will not break under normal conditions. If a person really wants to go through a door that is deadbolted shut they will likely need to break down the whole door or crack the door frame in order to get through to the protected area. Deadbolts are available for most types of doors so be sure you ask your locksmith about having your home's entryways equipped with these locks. Access control systems are more commonly found on commercial buildings but by utilizing these systems at home you can create a high security fortress that is highly difficult to access without the proper credentials. These systems provide entry with a key card, pin pad or fingerprint and can monitor movement in a home so the homeowner can see exactly what's happening in real time using their smartphone or other device while away. If you keep highly sensitive, important or valuable goods in your home, including precious metals, documents, cash or otherwise, be sure to keep it in a home safe. A safe will help prevent it from being stolen, but with the right safe, it will also protected from flames if a house fire breaks out. Home security should not be taken lightly. If you need assistance with improving home security in Reno, Sparks, or the surrounding communities, visit Reno Sparks Lock & Safe. We offer a number of locksmith and security services for home and office. To learn more call our Reno locksmith team at (775) 525-5712.